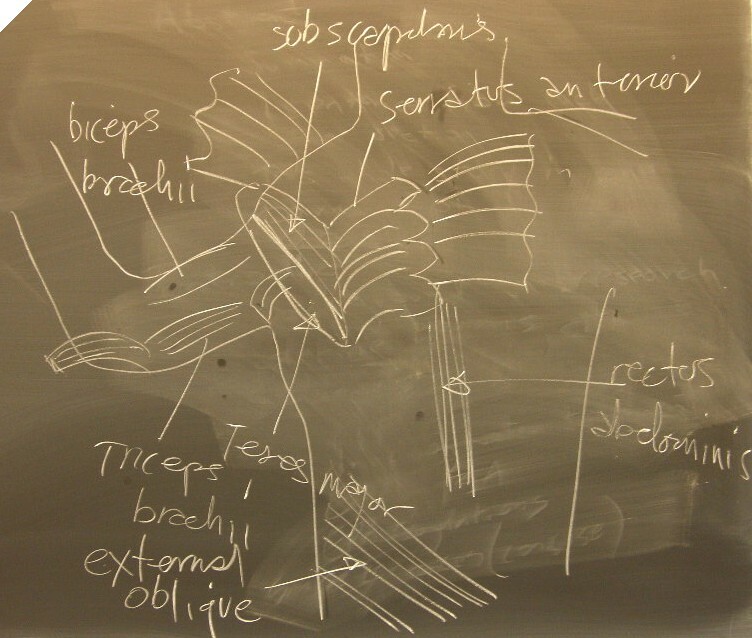 4) Second illustration of the deep dorsal muscles. Undissected chest. Remove as much adipose tissue and fascia as you can so that the fibers of the muscles can be seen. Can you find the pectoantebracialis, pectoralis major, latissimus dorsi and triceps brachii? Here is the same image with the chest muscles labeled. 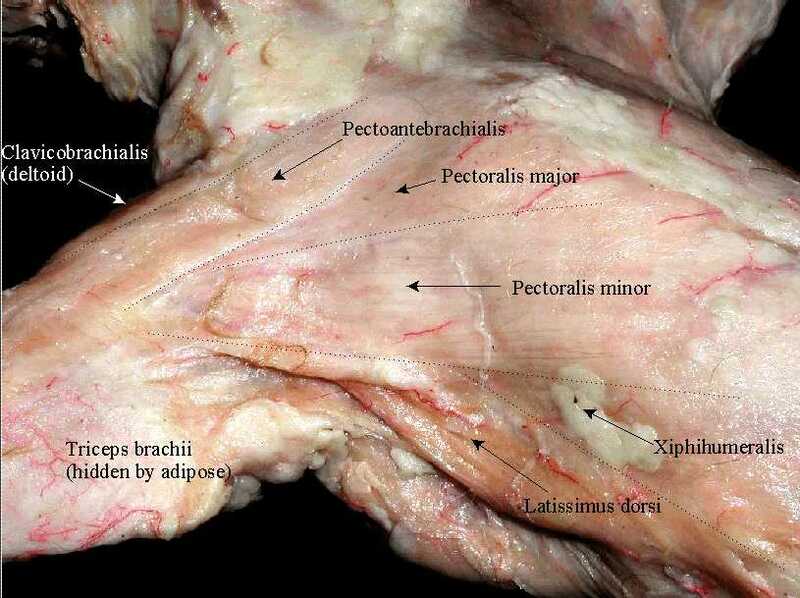 The pectoantebrachialis has been separated from the underlying pectoralis major, and is being lifted in the image. Origin: manubrium, insertion: proximal fascia of forearm. The deltoid (called clavobrachialis in the cat) has been freed from unterlying tissues. Origin: clavicle. Insertion: lateral humerus. Lift deltoid and pectoantebrachialis as a unit and cut and reflect. The pectoralis major has been pushed aside and pectoralis minor is being lifted by the probe. In humans, pectoralis originates from ribs and inserts in the coracoid process of scapula. The superficial-most muscle of the anterior surface of the arm is the epitrochlearis. It has no homolog in humans. 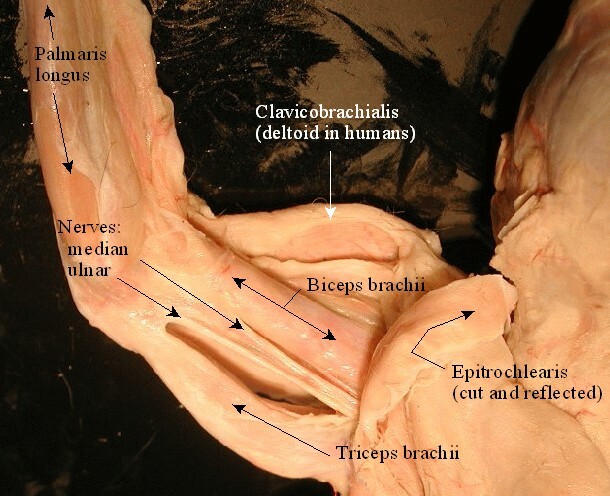 It must be cut and reflected to see the underlying triceps brachii and biceps brachii. Here is a labeled view of the ventral surface of the upper appendage. With the pectoralis major and minor cut and reflected, the scapula will fall away from the chest to reveal the subscapularis on its underside. subscapularis Origin: subscapular fossa. Insertion: lesser tuberosity of humerus. 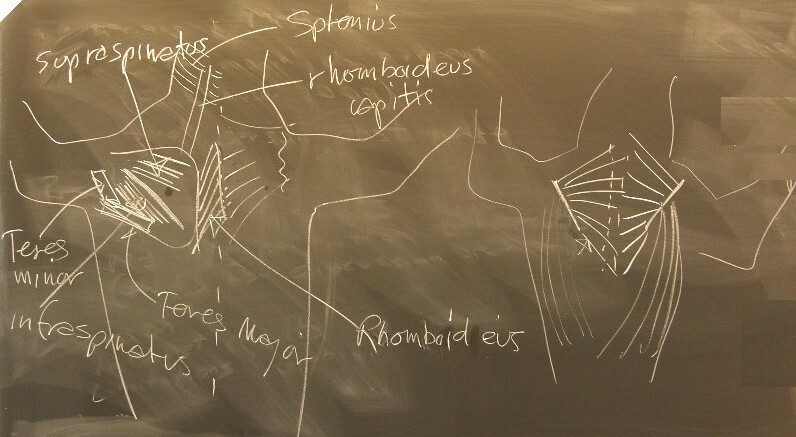 Here is a labeled version of the deep muscles of the chest and scapula. Caution: the trapezius is very thin and easily torn when outlining it with the probe. Remove cutaneous muscle layer, note the boundary between trapezoid and the latissimus dorsi which plunges below it. 1. Lift trapezius from underlying latissimus dorsi. 2. Cut and reflect trapezius to see muscles related to or on the scapula: (p. 25). 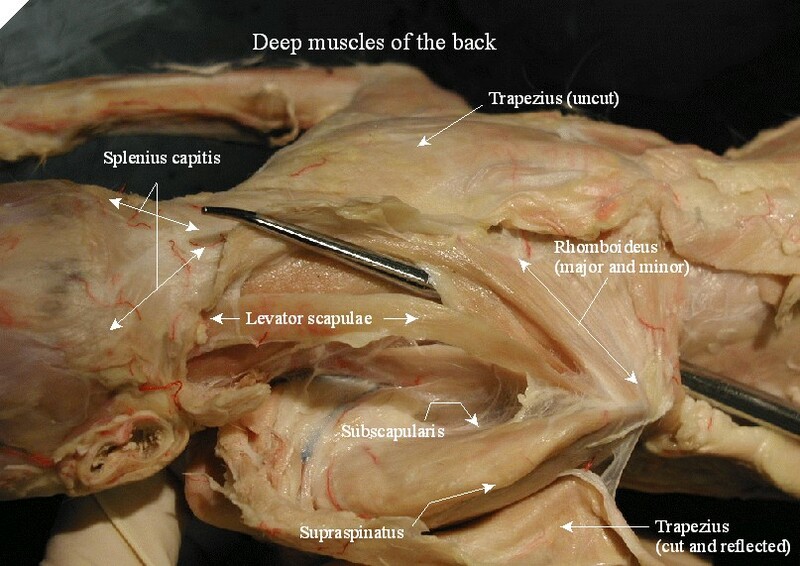 Here is a labeled view of the deep muscles of the back and scapula. Seen below the rhomboideus muscles. The “bandage” muscle in the posterior neck. Origin: upper thoracic spinous processes. 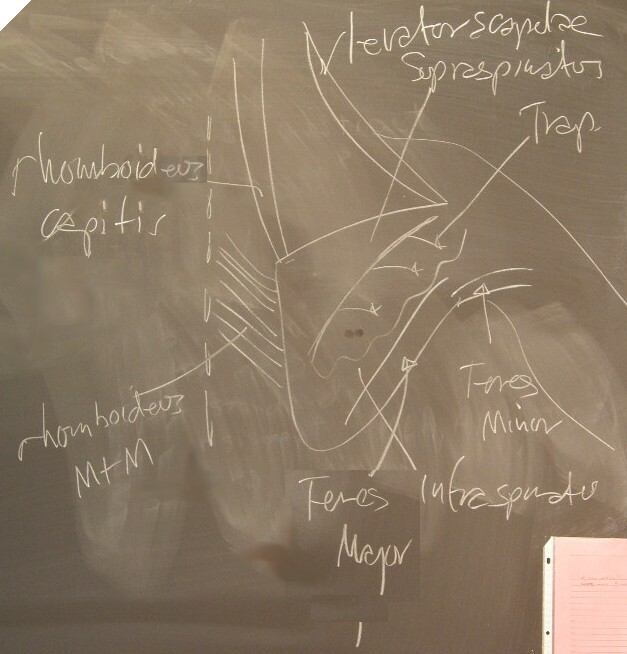 Here again is a labeled view of the deep muscles of the back and scapula.